Déménagement en provenance/direction de Wichita, KS? Les remorques fermées et carrossées de U-Haul sont ingénieusement conçues pour protéger et retenir vos biens précieux, alors que nos remorques ouvertes sont idéales pour tirer des matériaux de construction ou d’aménagement paysager et des articles de gros volume. Les remorques pour voiture de U-Haul sont dotées de rampes à chargement facile pour un chargement sans effort des véhicules, alors que nos remorques pour moto sont légères et faciles à remorquer. Obtenez GRATUITEMENT des estimations de tarif pour la location de remorque à Wichita KS 67230 dès aujourd’hui! Les remorques fermées à Wichita, KS sont légères, aérodynamiques et conçues pour offrir une plus faible consommation de carburant, facilitant le remorquage. Chaque année, des millions de familles utilisent nos remorques carrossées pour déménager. U-Haul offre une vaste sélection de remorques carrossées à louer dans la même ville ou pour un aller simple. Consultez les tailles de nos remorques fermées et réservez en ligne une location de remorque chez Absolute Natural Stones! Les remorques ouvertes sont idéales pour le remorquage de charges grosses ou surdimensionnées à Wichita KS 67230. De nombreuses remorques ouvertes sont louées avec une rampe de chargement pour plus de commodité. La sélection de remorques ouvertes offertes chez Absolute Natural Stones représente une solution abordable pour des projets d’amélioration résidentielle, la livraison de meubles ou le remorquage de véhicules récréatifs. La location de remorque ouverte est également populaire auprès des entreprises pour la livraison et lors de salons commerciaux. Les remorques ouvertes sont offertes en une variété de dimensions et de styles afin que toutes les voitures puissent les remorquer. The most excellent customer service I have ever received at a rental place. They met me at the door and unhooked the trailer for me. they went to get the trailer for me and hooked it up when I first rented it. THEIR CUSTOMER SERVICE THOUGHT WAS SUPERB! Very quick, efficient and friendly check- out and check-in process. Everything went smoothly and exceeded expectations. Abdul made everything simple and smooth. No key code given on mobile pick up and it took 30 minutes for them to figure out correct code. Great location with tons of help and the customer service was some of the best I have received. There was an oil leak in the back from the last renters, but was so hard to see until you were on and in it, only reason why I put that hte equipment wasn't clean or well maintained. Other than that, the truck was in great shape! Cleaned it up and had a great feedback from both the location rented from as well as uhaul. Highly impressed with customer service. Thank you! I was concerned about your pricing as it changes by day. I purchase a 2 day one way trip on a 6 by 12 feet pull trailer for $60 and then on another day I purchased the same trailer and it cost me $109. Why it is different? Business was closed when we arrived and there was no contact number on the Dropbox. There was no good place for us to park the truck. The manager called me the next day and asked about the lock on the back of the truck. We rented an appliance dolly and blankets so we had to secure them when leaving at a closed business. The key for the lock was on the ring with the truck key but he was unable to locate it at the time. He said he would call me back and did not. I was charged an extra day even though the business was closed and they could not have rented the truck anyway. This was worst experience using your app to set up rental which was a clitch set for wrong date. Pick up my additional equipment request wasn't available to pick up with truck. Had to go to another location to rent equipment needed. Returning app wouldn't allow me to return due stated mileage was in correct spent 20 minutes trying return spent additional time waiting on 800 number to get help to have note added truck was returned and encounter clitch with app. Over all start to finish will never set up online again. 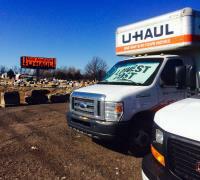 I've used uhaul for 20 years and this was by fare worst experience. Not sure was locations fault but honestly online needs a lot of work getting bugs out. tires were worn on trailer. I was helped by Abraham. He was awesome. We had a tricky situation with contracts and blanket rental that could have easily turned against me. Abraham was straightening it out even before I asked him to. Thanks so much! That kind of service is what makes me a loyal u-haul customer. Abdul Jesri was great and helped straighten out a billing question I had. Thx. Everything was absolutely perfect. Pick up and drop off location!!! We hardly ever need to use this service, but it was easy to navigate online to request and the truck was ready to go for us. My email is being fraudulently used. I have tried every avenue (email, chat support, telephone support) to get you to remove my email from this man's account. Now I have to stoop to this.